Hebrew Language Academy Awarded “Facing History and Ourselves” Grant. 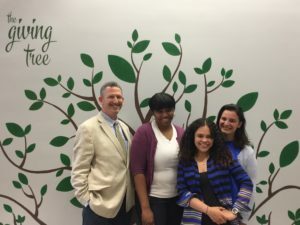 Head of school, Peter Katcher and the team of teachers who applied for the grant: (l-r) Natalie Guiteau, Flor Placencia and Deb Gravina. Hebrew Language Academy (HLA) was awarded the Facing History and Ourselves In-Depth Program Grant for 2017-18 school year! By receiving this notable award, the school will benefit from professional development opportunities that will encourage tolerance, empathy and civic responsibilities among the school’s diverse community. Facing History and Ourselves is an international educational organization that teaches staff and students tolerance and empathy through the study of the Holocaust and other historic events. By integrating the study of history, literature, and human behavior with ethical decision making and innovative teaching strategies, the program enables teachers to promote students’ historical understanding, critical thinking, and social-emotional learning. The award includes professional development opportunities and teaching materials for staff and students valued at more than $10,000. As part of the grant award, the two teachers associated with the program will attend professional development seminars this summer. Social Studies teacher, Flor Placencia will take a 3-day seminar in Philadelphia focusing on the Holocaust and Human Behavior. ELA instructor, Deb Gravina, will take an online course on a new approach to teaching “To Kill a Mockingbird” which incorporates civic education, ethical reflection, and historical context in the exploration of the novel. The teachers will then incorporate these lessons into the social studies and ELA curriculum. Head of school, Peter Katcher, said because of the school’s diversity, there was a need to address issues of cross cultural communication and understanding among the students. At the heart of HLA’s mission is to help students learn social and civic responsibility through the integration of community service and service learning into their classroom studies. Diversity, tolerance and openness are emphasized throughout the curriculum and school life. This award underscores the school’s mission to provide students with a solid foundation to become ethical, productive global citizens. https://hebrewpublic.org/wp-content/uploads/2017/03/hebrew-public-logo-136.jpg 0 0 Keciah Bailey https://hebrewpublic.org/wp-content/uploads/2017/03/hebrew-public-logo-136.jpg Keciah Bailey2017-06-08 20:20:272017-11-28 20:37:34Hebrew Language Academy Awarded "Facing History and Ourselves" Grant.